ALMOST FOUR IN 10 calls received by the Emergency Call Answering Service (ECAS) in 2017 were silent calls, new figures due to be published by Minister for Communications Denis Naughten reveal. The ECAS establishes the location of the incident and confirms the emergency services being requested, be it Garda, Fire Brigade, Ambulance or Coast Guard and Air Traffic Control in emergencies involving aircraft. The call or text is then transferred to the appropriate emergency service which then takes responsibility for the call and responds to the emergency. The ECAS operators continue to monitor the call until it has been accepted by the emergency service. In 2017, ECAS received a total of 1,807,568 calls which represents a 2.6% increase in volume compared to 2016 levels. Prior to this, the volume of calls to ECAS decreased each year from 2010 to 2016. This was primarily due to a reduction in the number of calls caused by faulty telephone lines being received in ECAS and changes in the design of mobile handsets and the significant increase in the use of smartphones in Ireland, making it more difficult to accidentally call 112/999. In 2017, approximately 786,000 calls were categorised as normal calls. “These are calls in which a caller directly requested a specific emergency service and is connected accordingly. The number of normal calls has remained relatively stable since 2011,” the statement from the Department of Communications said. Silent calls - calls to the ECAS which remain open without the caller speaking – decreased between 2010 and 2016 by over 915,000 calls, but in 2017 the volume of silent calls increased by 52,000 calls, 8% higher than the previous year. Meanwhile, 7.6% calls made were noisy calls, 1.7% were children playing and 9% fell into the “other” category. Looking at 2017 in general, call volumes continued to remain at around 150,000 calls per month. “Factors such as weather, flooding, holiday periods and the number of weekends in a month affect monthly call volumes in any given month,” the statement said. Of the major events, Storm Ophelia resulted in the most significant increase in call volumes. The ECAS received 9,007 calls on 17 October. 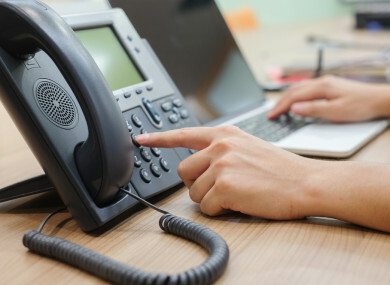 “During such adverse weather conditions, the increasing demand is directly due to an increase in genuine normal calls, as well as an increase in noisy calls caused by faults on the PSTN network dialling 112,” the department said. The call volume peaked on 17 October at 1.46pm, when the ECAS received 218 calls in 15 minutes. The volume of noisy calls received on the day was five times greater than the average. Email “Almost 4 in 10 calls received by Emergency Call Answering Service in 2017 were silent ”. Feedback on “Almost 4 in 10 calls received by Emergency Call Answering Service in 2017 were silent ”.